Call me crazy, but I like darkness. I believe that I see more clearly on overcast days, that I feel more viscerally with my eyes closed, that I hear more distinctly when inwardly focused. When emotional darkness appears, I feel curious. When “dark forces” appear, I’m not afraid. It wasn’t always like this. When darkness came, I wanted to run like hell. Or shine bright lights into it. Or drown it away somehow. I started sobbing way before the teacher at my noon yoga class referenced light/darkness/Solstice. Taking a seat on that mat, I realized I’d not been still for a while. I’d not processed the wonderful changes happening in my life. A new job in a new area of the restaurant world. A week of house-/cat-sitting in a beautiful neighborhood across town. A new apartment move this coming Spring. Wonderful – and, immense changes. The job has offered a set of new challenges. The house-sitting was unsettling. The journey to secure the apartment, the eventual departure from my “family” of housemates (including our lovely kitty), the vulnerability of moving in with a brand new friend – all bittersweet. I’d also not processed the amount of hostility I’ve witnessed in the world around me lately. And, I’d not processed the surprise of seeing my ex- (who betrayed me horribly in 2010, then went to prison for the related crime) on the street, an entire year early of his scheduled release date. Phew. So. I came to a safe place today. In a yoga studio. With a deeply wise and compassionate teacher. Atop a sacred mat space. And I set the intention for clarity and truth. In that stillness, a buried trigger arose. I realized that I felt completely unsafe in the world. In danger. Threatened. Oh my god, I cried. I couldn’t even chant the opening “OM”s without choking up. My face was soaked, my ears filled with tears, my nose ran uncontrollably. And I encountered the impulse to run like hell. To get out. But I stayed. I stayed and I practiced. As I flowed through the very dynamic sequence, there were times when I couldn’t think of anything but where to place my body parts. Other times, I was filled with terror for my security. Still other times, I had space for self-inquiry. “Are dangerous people trying to hurt me? Do I need to make additional life changes in order to be safe?” I kept asking myself questions until – as intended – clarity and truth surfaced. The crying stopped. Acceptance, compassion and resolve arose. I found myself approaching Warrior 2 – the most basic of poses – the same way I’d taught my 1st group of youth students back in 2009. The lower body, with its grounded and stable lunge shape, represents unshakable foundation and strength. The upper body, with its broad heart center and outstretched arms, represents a balance of vulnerability and risk. I used to tell kids to look out over their front fingers and envision the “enemy” (the bully, the dreaded exam, the violent home space). To encounter their enemies while so firmly grounded, that nobody nor nothing could threaten their wide-open hearts. Today, as I stared down my enemies, the palm of my front hand organically turned upward, and I could feel my fingertips touching the warm and wanting hearts of those human beings. I have nothing to be afraid of. A friend recently called me “fearless” because I talk openly about pain. The funny thing is, I nearly decided to keep today’s yoga class experience to myself. I have a big New Year’s Eve workshop approaching; and I worried that people might not want to be led by a crying, scaredy-cat teacher. Then I reconsidered. I was reminded that stability and risk co-exist. I learned I can simultaneously – and calmly – feel afraid and be safe. If I had run, or hid, or drowned, or denied…if I had not faced and inquired about my fear, I wouldn’t have understood it the way I do now. Although not completely liberated from fear (I need to find the tools to be present and clear with certain everyday things), I own it; and, I distinguish it from situations, places and people. Today, I realized that the hearts of those formerly-perceived scary people are just like mine – and, they are at the fingertips of my fearless, outstretched arms. May stillness come; and may truth and clarity continue to illuminate this wonderfully dark day. 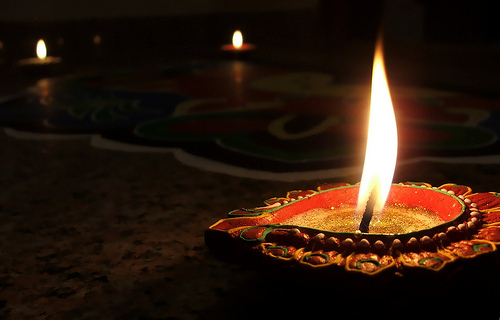 This week marks the Indian holiday of Diwali, which is generally known as the Indian Festival Of Lights. Yet, it signifies so much more. Most markedly, the 5-day festival celebrates the triumph of Light over Darkness by recalling the many battles won by virtuous warriors over evil demons. On a social level, it represents a time of families gathering to share sweets and sweetness, couples honoring their partnerships and siblings acknowledging their love. On a practical level, the holiday signifies a fiscal new year, when businesses start a new financial calendar, take inventory and take stock. For me, the arrival of Diwali marks a period of taking stock in all areas of life, and, of beginning to shape intentions for the next calendar year. Annually, from late July (my birthday) through the early Autumn (Equinox, Jewish New Year and my sobriety anniversary), I spend time reflecting on the prior year. That reverse reflection shifts into all-wheel-drive when Diwali arrives. There is something about the shift in weather that energizes me inwardly. My dreams start to spark up, my passions start to speak up. I begin taking stock of what I presently “have,” why I presently live and how I presently love. And so on. As I inventory my life, I start to look forward with deep intention. By late December (Winter Solstice and traditional New Year), I am feeling a positive pull toward productivity and manifestation. So while most yoga studios, yoga teachers and people in general are jumping on the Gratitude bandwagon for November, I am pausing to inventory my life – so I can jump on the approaching Sankalpa train with as much discernment, clarity and resolve as possible. I quit teaching yoga last week. There were so many reasons why; and it was a long time comin’. Still, my decision was rash and reactive – a result of not being honest with myself and not holding myself to truths untold. I might blog about the decision eventually. But, for now, I’m consumed with planning my New Year’s Eve Sankalpa Vinyasa workshop. Wait – didn’t I just say that I quit teaching yoga? This in itself marks a huge period of Autumn-supported reflection and inventory – I may change what I offer and how I offer it. As this change brews, I’m excited to look into some dark corners and see what I might illuminate going forward. Which brings me back to Diwali. Yoga has always given me permission to be authentic, my whole self. It has encouraged me to look squarely at my past, my present and my potential. It has kept me safe through dark times. It has made me curious about that darkness. And it has consistently guided me toward the light of truth. For this week’s Diwali observance, I’m re-reading and re-posting 2012 and 2009 blogs about the holiday – my perspectives and experiences have not changed. The ideas and practices are tried and true. I hope you enjoy them. November 15, 2012 – Diwali Class Featured in Huffington Post! I am honored (floored, really) to be featured in this Huffington Post blog (http://www.huffingtonpost.com/dawn-cherie-araujo/diwali-columbia-heights_b_2131582.html) – “Diwali Yoga in Columbia Heights,” by religion journalist Dawn Cherie Araujo – about our special yoga class last night. As my friend Sachin notes in the article, the practice was mind-blowing. I will not take credit for that outcome, however – it’s the result of the yoga itself, and a roomful of very strong intentions. Heartfelt thanks to our students, from our wonderful little 8-year-old guest to the rest of the yoga veterans in the class. Yoga is such a gift. Love love love… OM Shanti. 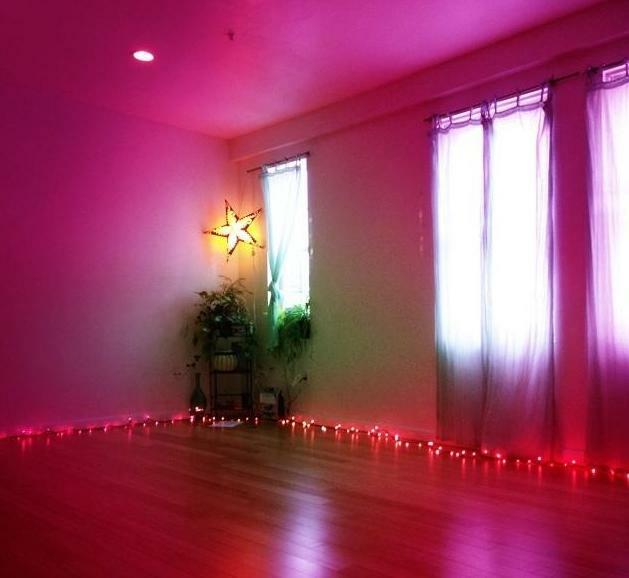 In less than one hour, I’ll teach my annual Diwali-themed yoga class. This Indian holiday is commonly known as the “Festival of Lights,” signifying the triumph of light over darkness. Ancient history tells of a number of battles across the nation ending, with great victories over evil forces. To welcome home the heroic warriors on the dark eve of a New Moon, villagers lit their paths with glowing oil lamps. Hence the ongoing tradition of celebrating this particular New Moon with lamps, fireworks and other uplifting festivities. For me, Diwali reminds me of the necessity of both darkness and light. I used to be very, very scared of the “dark.” The moment a hint of sadness or lowness or depression showed up, I was in action – figuratively lighting my oil lamps to brighten things up. These days, I have found a strength in welcoming times of darkness, struggle, challenge. Not that I like to dwell there for long – I can appreciate a rough patch and at the same time know that I must do some reflection and practice to shed light on its lesson. So there is a balance. Darkness and light must exist. As for battles – I will admit that sometime my greatest battle is with myself. Although I have come to be at peace during most of my dark times, there are still situations where my fears can get the best of me. They can lead me into poor choices, rash decisions, intense self-protection. But less and less. Thankfully. So today, my greatest victory is not when I “win a battle,” but when I surrender my fears and allow the battle to dissolve. What are your battles? Which have you “won?” Celebrate them tonight! And which have you surrendered from? Celebrate them, too. Recognize your victories. If you are currently in a dark time, have hope for the triumph of light. ‘Tis the season of shortening days. Autumn calls us to enjoy the comfort of candles, fires, warmth. To cultivate our own light. This very natural, womb-like, growing darkness can be an invitation to experience a balance of darkness with light, of light with darkness. Enjoy. I have a confession: I’m scared of the dark. Well, not “the dark,” as in a dark room, or a dark forest or dark places like that. I’m afraid of the dark-ness within me. That’s right, folks. This Diwali-celebrating, Jewish-new-year-observing, eight-limbs-of-yoga-loving gal gets sucked into the tunnels of doubt, despair and even depression at times. Another confession: I think sometimes I try too hard to “dissolve” that darkness. Heaven forbid I head back to that bottom mentioned in my 9/24 “Welcome to the Urban Yoga Den” entry. Even now, nearly 20 years later, when darkness taps at my door, I feel terrified. My solution? Do something. Quick. Light candles, exhale and let go, practice more rituals. Do, do, do. Y’know all this new moon/Autumn/Diwali activity that I’ve been writing about and practicing lately? Is it healthy and positive, or is it my way of escaping the discomfort of life’s dark moments? The fact is – life hurts sometimes. The question is – should I run away by engaging in non-stop activity; or should I take a deep breath, stick around and see what happens? I saw Where the Wild Things Are last night. When I first saw the trailer back in July, I sobbed. That kid’s pain leaped off the screen and into my chest. And when he leaped into his fantasy world…wow…without getting into the details of my childhood, let’s just say I related big-time. And that was only the trailer! In the original Where the Wild Things Are storybook, it take Max 12 pages to travel from his bedroom forest to the wild things’ island. His journey in that little sailboat lasts “through night and day and in and out of weeks and almost over a year.” All of that time and effort to leave the past, the pain, the ickiness behind! And in the end, where does he end up? Where the wild things are – an island of monsters. Seems familiar to me. Hmmm. How gratifying to finally see the film after so much anticipation. Spike Jonze hit the nail on the head. I’m getting choked up simply recalling how vividly he portrays a child’s reactions to confusion, betrayal, neglect and alienation. How a child creates a fantasy world in order to cope. How that child learns that, even in his imaginary kingdom, there is confusion, betrayal, neglect and alienation. I’m that child. I mean right now. I’m that kid. It’s taken a while, but I’m learning that even with the warm glow of Diwali’s lights, even with the sacred space of yoga, even with the refuge of doing, doing, doing – life happens. Monsters will always show up – on far-off islands, at home, in loved ones and within my own self. Where humans are involved, there will be pain. There will also be joy. Where reality exists, there will be darkness. And there will also be light. So there’s nothing to be scared of after all. Sometimes I feel very emotional after teaching a particularly energized Integral Yoga class. Tonight was one of those times. For the months of September and October, our classes have focused on Pranayama (see Tips-n-Tools for more on our bi-monthly focus), or breathing practices. Complemented by this week’s waning moon and the coming of Fall, our exhales have come to mean more than a mere letting go of air. Indeed, they’ve become symbols of transformation. So at tonight’s IY class at Past Tense Studio, under a rainy sky and just four days before the new moon, we imagined our battles, troubles and trials in the palms of our hands. Holding our palms together at heart-center, we honored this darkness, and perhaps grew to understand it. Next, after inhaling our fingertips toward the sky, we exhaled and allowed our arms to open wide, releasing our darkness. With each exhale we began to dissolve what no longer serves. The intention in the room felt so deeply human, even vulnerable. How could one not be moved? Today marks the opening of the Indian holy days called Diwali – from the crescent to the new moon, as that pie-in-the-sky whittles away to nothing, Hindus, Sikhs and others celebrate the proverbial triumph of good over evil within individuals. During this Festival of Lights, as the night sky darkens to moonless, the golden glow of oil lamps fills streets and homes. Indian folkloric tales share the journeys of historical characters returning from exile, imprisonment and battles to be welcomed by candlelit temples and rows of oil lamps. And here in the Mid-Atlantic, as the moon disappears and the change of seasons falls upon us, we exhale in yoga class and let go, let go, let go – making room for more light within. In Autumn, nature begins its own process of letting go. Green grass turns dry brown, leaves turn brilliant colors then drop to the ground, blue skies surrender to misty grey and the sun sinks lower each day. Things appear to be dying in the fall. At the same time, gardeners plant bulbs that nestle in the ground to be nurtured by fall’s fertilizers. ‘Tis the season to say goodbye to the old, to let it die off and sink away. So plant your bulbs and let them rest while you live each changing moment of autumn. Light a candle, wish your darkness farewell, then let yourself glow. I am setting a Diwali intention. Between today and the new moon of Sunday, October 18th, as that sliver of a moon disappears, I invite you to join me in envisioning your darkness between the palms of your hands – embrace it, honor it, understand it. Lift your fingertips to the sky, and exhale to let go, let go, let go. May the light of truth overcome all the darkness. OM Shanti. As most of you know, I moved to Nashville two months ago. What you might NOT know – unless you follow Urban Yoga Den on Facebook – is that, indeed, the last eight weeks have been the toughest challenge of my life so far. Darkness…oh yes, darkness. And that ever-present tug back into the light – or more appropriately, the ever-present tug OF the light that always complements that darkness. I haven’t had time to write a proper blog since the move. As I hinted, I’ve primarily been writing shorter Facebook posts (check them out, if you wish!). Because tomorrow night marks the Lakshmi Puja for Diwali – one of my favorite holidays – I’ve pasted past Diwali posts below. A little visit to the Urban Yoga Den archive. I hope you enjoy this. OM Shanti. As my friend Sachin notes in the article, the practice was mind blowing. I will not take credit for that outcome, however – it’s the result of the yoga itself, and a roomful of very strong intentions. Heartfelt thanks to our students, from our wonderful little 8-year-old guest to the rest of the yoga veterans in the class. The night before the world would end, my heart exploded. I’d been asleep for about an hour, when my eyes gently opened. I was lying on my back, with my hands resting on my chest. Suddenly, in the core of my heart center, I sensed a feeling that is hard to describe. At once heavy and liberating, full and breathless, sinking and expanding. Something profoundly beautiful softly exploded in my heart. After a little while of witnessing, I went back to sleep. I love Winter Solstice. Well, I love just about any nature-related event, holiday or observance. When the leaves fall, when the creek swells, when the days lengthen, when the darkness falls. This year I planned to observe Winter Solstice as a day/evening to celebrate our eternal inner light. This idea started as a response to the media’s apocalyptic frenzy, which started months ago. At first I mocked the “end of the world” hype, because I was quiet certain that 12/21/12 was not going to be the end. If anything, it would be a beginning – as all Winter Solstices are: the beginning of light returning. Then, over Thanksgiving weekend, I heard a very serious NPR story about people who were planning their suicides due to their understanding of the 12/21 prophecy. I deeply absorbed that some people were feeling so much fear and pain that they could just call it quits. And instead of mocking the apocalypse, I started focusing my energy on sending compassion to those hurting beings. I stopped commenting on related Facebook posts, I outright avoided conversations about the topic. Because I wanted to focus on Ahimsa, on kindness, on compassion. Rather than on the hype and fear, or on those who claimed to know the real deal and sounded preachy. I was confident about my beliefs on the subject. So I chose to focus on sending light to the fearful. On Friday, 12/14, a horrible tragedy struck Connecticut. I grieved – at the same time, I used the Yoga Sutras in order to show up for others. In the midst of debates and blame and outbursts and (again) fear, I focused on sharing compassion and on cultivating my own inner peace. With so much pain and fear and darkness all around, I aimed to share light. The evening before 12/21, I slipped up. I commented on someone’s Facebook post about the end of the world. They responded negatively. We discussed, we stated our cases, we battled. He de-friended me. We continued to dialogue via messages. We stuck with each other. We learned, we gained understanding. In the end, we reached total reconciliation. We healed. In my friend’s words, “We burned some samsara together.” Indeed we did. We fired up the light. A few hours later, I participated on a group phone call with a beloved yoga teacher. The call started with a meditation and included a talk about 12/21 – the Winter Solstice, and, the Mayan Prophecy. My beliefs were reinforced – the world would not end; there would be a fresh beginning. Over and over, the teacher encouraged listeners to keep doing our inner work, our practices for self-awareness and transformation. To embrace the shadow, as well as the love and light. To heal ourselves and then our relationships. To do our sacred work and therefore be in service to all. I hung up from the call early so I could be asleep by 10:45pm and awaken in time to meditate through the moment of Solstice – 6:12am EST. About one hour later, my heart exploded. Today, 12/21/12, the world did not end. I woke up and sat in the pre-dawn stillness. The city was at once silent and buzzing. This evening, I taught a wacky Winter Solstice yoga class with mood-brightening music and heart-opening poses. We practiced without lights, to prove that our inner light could not be darkened. As I prepare to go to sleep, my heart feels at once silent and buzzing. There’s a little love explosion happening in there. I recently found myself apologizing to god. It was the umpteenth time that I’d broken out in sobs while singing along with Jai Uttal’s “Om Namah Shivaya.” To be exact, it was Monday, October 24th. I was driving to rehearse with The Shaktis, an all-female Kirtan group with whom I play percussion. Two days before, I’d returned from a little road trip to Pennsylvania – first, Philly to see Jai Uttal in-concert; then, Easton for a two-day Max Strom yoga workshop. The day after the road trip, back home in DC, The Shaktis lead one of our most joyous and spirited Kirtans yet. So as I drove to the rehearsal that Monday, I was brimming with contentment. Chanting my little heart out. And suddenly, sobbing uncontrollably. Gratitude! I was crying my thankfulness, realizing I’d come full circle. I mean, my goodness, since the Spring I’d been through intense periods of questioning everything. My yoga practice, my yoga teaching, my yoga jobs, my other jobs, my relationships, my associations, my everything! I started to let go of what felt wrong, what felt like sandpaper against my skin, what felt threatening to my wholeness. I let go of a lot. And I ended up feeling completely lost. Lost in a darkness that felt like drowning. 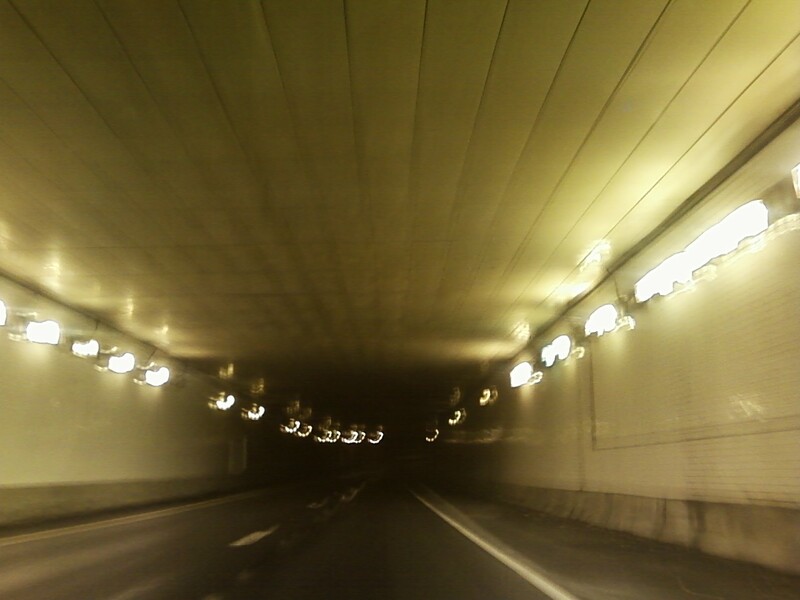 As they say, there is a light at the end of the tunnel. Come end of Summer, I began to emerge. I launched “The Happy Heart Project” and set the firm intention to grow toward joy by practicing a symbolic ritual – burning a stick of “Happy Heart” incense 1st thing each morning for 100 days. I took a Labor Day retreat to the Satchidananda Ashram and had a heart-to-heart conversation with a twisted old pine who seemed to beautifully signify the trials and triumphs of my life. The Jewish High Holy days stirred my sorrow, yet also reinforced my softening, my surrender. Friendships challenged me; and friends cherished me, despite my awkwardness. Autumn – my most transformational season – crept in, grey and wet, and dampened my growing inner glow. And then I sunk lower than ever, my emotional sobriety on edge, my physical sobriety at risk. The week before I would reach my 9th anniversary without alcohol or drugs, I craved their comfort. I stayed honest. I stayed close. I took a road trip. There’s something about a geographical cure. There were no twisted, story-telling pines on this journey. Just a change of scenery. A break from my “stuff.” Strolling the country’s oldest Farmer’s Market, breathing northern air, driving new highways. Chanting with Jai and other transplanted pals in Philly. Breathing with Max and long-lost Off the Mat Into the World sisters in Easton. So returning from this trip, I was – after a period of tormenting darkness – finally back in the light. I was sober, safe and sound. That Monday, singing my heart out to Shiva, I cried. I cried because I made it through. I apologized for having become depressed, for being in the dark so long. As if I had left god’s side, influence, presence, light. And it hit me – NO! God took me there. God took my hand and led me into that darkness, because there was something I needed to see. Remember all of that questioning and letting go that started in the Spring? It sprang from a mugging – an incident I wouldn’t wish on anyone, but that brought out a fierceness in me. I started to put my foot down, to set strong boundaries. I also started to overreact to certain upsets. Because in fact, the mugging was a trauma, which triggered unresolved past trauma that needed attention. And it didn’t just tap me on the shoulder. It broke down my door. By force, I had to get the help I needed in order to look at it, start to heal from it…and no longer be ruled by it. 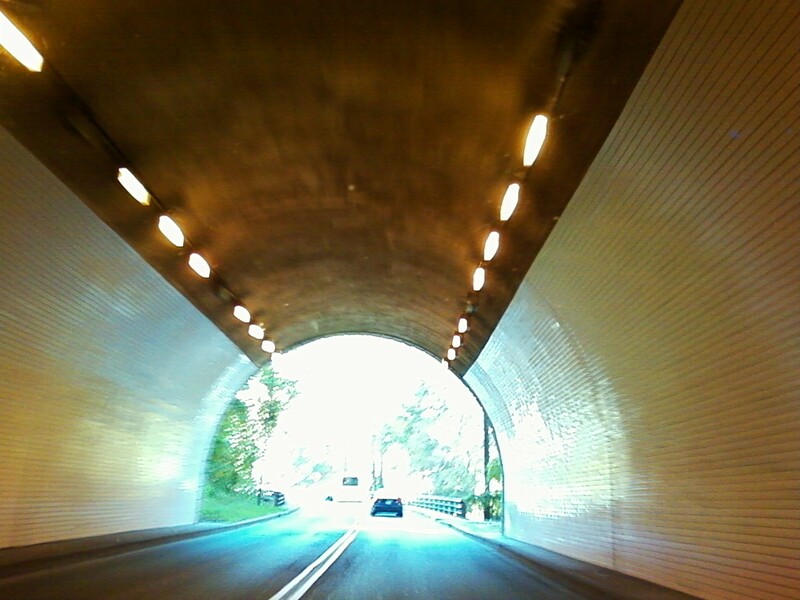 So there might be a light at the end of the tunnel – but sometimes, the tunnel itself is well-lit, and leads into the dark. And into the darkness we went. God and I. So I could experience that depth of despair and subsequent transcendence to joy. So ultimately, I could share the story with others, in case they ever go through something similar. God was with me the whole time. No apology necessary. I went where I was meant to go. It makes sense to me that god, in the form of Shiva, led me deep down to the bottom. To show me the realities that needed to be faced. The same realities that now inform my purpose, inspire my actions and give me something to share in service to others. During that dark period, I was yearning for surrender, security and trust the whole time. Now I know that I was never alone. I was always safe. And I was always loved. And for that, I cry tears of gratitude. OM Namah Shivaya.